Scroll down to see our selection of Stethoscopes and Parts for sale. Stethoscopes are a device used in any medical treatment. We carry all the major brands of stethoscopes in all the popular styles. We sell the Littman, Mabis, Clear Sound, Labtron brands in cardiologist stethoscope, standard doctor stethoscopes, pediatric stethoscopes and even teaching stethoscopes where 4 people can listen to the same stethoscope at the same time. 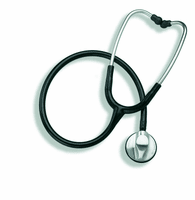 Stethoscopes are used for a wide range of medical diagnosis's. A stethoscope is an acoustic medical device for auscultation, or listening to the internal sounds of a body. The stethoscope is used to listen to the lungs and heart most often. It is also used in combination with a blood pressure cuff to measure the heart rate and blood pressure. The stethoscope is probably the most used diagnostic tool that a doctor or nurse uses. The are many levels of stethoscopes and price ranges. Simple ones that are used only to check blood pressure are just a few dollars while a cardiologist stethoscopes is a very delicate instrument capable of hearing the slightest heart murmur can cost a few hundred dollars..